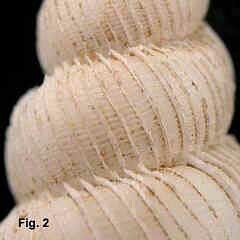 Description: Shell slender for genus, variable in height to width ratio; whorls connected. Whorls rounded, with 28-40 axial ribs per whorl. Ribs mainly thin and low, sometimes tall and rolled back on last whorl; not peaked, not continuous from whorl to whorl. Whorls with spiral threads between axial ribs, about 20 on second-last whorl. Aperture oval; outer lip with normal rib externally. Umbilicus slightly open, almost concealed by inner lip of aperture. Colour white. Operculum unknown. Size: Up to 20 mm in length. Distribution: Endemic to Australia; Northern Territory, around northern Australia to Sydney, NSW. (Weil et al. (1999) extend the range to South Australia, but there is no evidence for this). 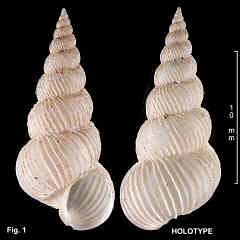 Habitat: In NSW, known from only three lots of empty shells dredged from Sydney Harbour. Rare in NSW. Comparison: See "Identification of the NSW species of Epitonium" in the introduction to this family. Synonymy: This may be the same as the tropical Indo-West Pacific species E. immaculatum (Sowerby, 1844).